Four talented, emerging composers/songwriters have been selected to have a six-month one-on-one composer mentorship through VocalEssence ReMix as they each write a choral work. 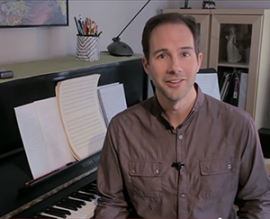 Tim Takach is one of four VocalEssence ReMix Composer Mentors. Each has been paired with a Composer Mentor, and on Saturday, June 6, they will gather for a One-Day Summer Workshop where they will meet with VocalEssence Artistic Director and Founder Philip Brunelle, their Composer Mentors and a quartet from the VocalEssence Ensemble Singers. Through the experience of writing short pieces and hearing them read by the singers they will learn the finer points of writing for voices. Professional singers will premiere the composers’ finished works at the annual American Choral Directors Association of Minnesota State Conference in November. Emily will graduate in May with a Bachelor of Music in piano performance from Concordia College in Moorhead, Minnesota. She has written several choral and instrumental compositions, and serves as accompanist for the Concordia College Office of Ministry. Emily is a piano teacher and has performed in several vocal and piano ensembles, including Bel Canto. Michael has written more than two dozen compositions, including commissions by the Central Iowa Symphony and the Grinnell Symphony Orchestra. He has a Bachelor of Arts in music from Grinnell College and served as assistant conductor of the Grinnell Singers and Grinnell Oratorio Society, as well as conductor and founder of the Grinnell New Music Choir. Liam has composed 27 choral and instrumental pieces; he has spent 17 years as a member of various choral ensembles, eight years with orchestral ensembles, and 12 years performing popular styles of music. Liam has been commissioned by trombonist Ty Peterson and saxophonist Scottie W. Wright, and last year received an ASCAP Plus Award. Daniel studied music theory and composition at the University of Minnesota Duluth and is now studying composition and songwriting at McNally Smith College of Music. His compositions include pieces for solo bassoon and string trio as well as a film trailer. His vocal experience includes ensembles at McNally Smith and the University of Minnesota Duluth.